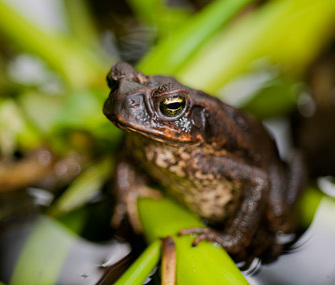 The Marine toad (Cane Toad, Giant Toad) is the most common culprit when it comes to toad poisonings. Contrary to the old wives’ tales, toads won’t give you warts, but they may poison your pet. While there are many species of toads, toxicity is largely dependent on the species that live in your area of the country. The two most important species of toad known for their toxic effects in dogs and, less frequently, cats are the Colorado River Toad, also known as the Sonoran Toad (Incilius alvarius, formerly known as Bufo alvarius) and the Marine Toad, also known as the Cane Toad or Giant Toad (Rhinella marinus, formerly known as Bufo marinus). The Colorado River toad is found in southern Arizona, southern California and southern New Mexico, while the Marine Toad is found in Florida, Hawaii and southern Texas. The Marine toad is very large and is the most common culprit when it comes to toad poisonings. Toxins secreted by these two species of toads can cause severe cardiac issues, among other signs. Owners should also be aware that, like many other species of animals, these toads seem to be slowly expanding their historic ranges northward over time. Species of toads that are found in other regions of the United States, such as the American Toad (Bufo Americanus) and Fowler’s Toad (Bufo Fowleri) are less toxic but can still cause drooling and vomiting due to their bad taste. All toads can emit some type of toxin, but no cardiovascular problems are expected with these other species. The main toxin found in toads of most concern, however, can lead to cardiac problems, including abnormal heart rhythms as well as neurological and gastrointestinal problems. Exposure to the toxin slows down the heart rate and causes the heart to beat erratically. Signs of toxicity can appear within a few seconds of the toad encounter and may include vocalization (crying), pawing at the mouth or face, hyper-salivation (heavy drooling) and vomiting. The cardiovascular or central nervous system signs can take 30 minutes to 6 hours to appear. Pets may experience weakness, lethargy, high or low heart rates, panting, difficult breathing, tremors, seizures and death. With their predatory instincts, it is common for dogs to catch toads in their mouths. Toads will release their toxins when they feel threatened. The majority of toxins found in toads are in the parotid glands located behind the eye, but the Colorado River Toad has additional toxin glands on its hind legs. The toxins are found in the milky white secretions that are emitted by the glands and are used as defense chemicals by the toad. These toxins are absorbed through the oral cavity mucus membranes of the pet when the toad is picked up or bitten and by the gastrointestinal tract if ingested. Pets are most often poisoned in the very early morning hours or after dark when toads are more likely to be active. Most cases are reported between June and September when toads are the most prevalent and the humidity is high.